Abundance: Scattered records across the Piedmont and Coastal Plain; probably more abundant in the right habitat. Habitats: Recorded recently from mixed hardwood forest habitat. Comment: Some forms of this species closely resemble other species. Form subnubila of A. rufostigmosa is very similar in appearance to A. stolata; the width of the midline stripe might be a helpful field mark differentiating the two, as A. stolata seems to have a more tapered, thinner stripe on the head while the stripe is broader in A. rufostigmosa. A. rufostigmosa is also similar in appearance to A. lawsoniana and A. ohioensis. The bold red lines on the midline of lawsoniana, with the brown background, might be a good field mark for distinguishing this species from A. rufostigmosa, the latter of which seems to be more red overall. Regarding A. ohioensis, this species has a pale thoracic venter and mesosternum while A. rufostigmosa has a dark mesosternum with otherwise pale venter; an underside shot is therefore very helpful in differentiating between species. But due to the similarity between several species, some individuals might not be able to be told apart in certain instances. There are several Erythridula species that have a dark, reddish-brown band along the length of the hopper. These species are: lawsoniana, rufostigmosa, ohioensis, wysongi (BG), and similalis (BG). Similalis is primarily a Florida species, but has been recorded recently from South Carolina; it has a thinner dark band (which is reddish-brown) down the wings and body, and the lines bordering the band are yellow and orange. Wysongi does not always have the dark band extend onto the vertex, sometimes it is pale (the band itself may not be as dark as in other species); a key mark is the entire underside of the body, including the face, is dark. Ohioensis and [some forms of] rufostigmosa are similar to one another, as both have a band that is more reddish-orange than brown and not overly dark, and the bordering lines to the band are prominently reddish; these red lines are thicker than in lawsoniana and have a plate-like aspect to them, covering most of the clavus. Regarding ohioensis, this species has a pale thoracic venter and mesosternum while rufostigmosa has a dark mesosternum with otherwise pale underside; an underside shot is therefore very helpful in differentiating between species. However, due to the similarity, ohioensis and rufostigmosa may not be able to be reliably separated from one another, but ohioensis has yet to be recorded in the Southeastern United States so individuals in this category could tentatively be called rufostigmosa for now. Rufostigmosa also has a very dark form, var. 'subnubila', that has blackish wing and body markings. This form is extremely similar to E. stolata and E. divisa, and there is no reliable way to distinguish between these species due to variation and overall similarity; see here for more info. Finally, lawsoniana has a dark brown mid band with thinner reddish bordering lines. See below for descriptions from the 3I Dmitriev database that show the degree of similarity between species. lawsoniana- Dorsum yellow or white. Color pattern red or orange or brown. Vertex with oblique lateral vittae or with large basal dark area often extended onto pronotum. Vertex midline pale or dark. Anteclypeus pale, concolorous with rest of face. Pronotum dark with pale lateral margins or pale with two longitudinal stripes. Mesonotum entirely dark, apex concolorous with rest of mesonotum. Thoracic venter with dark mesosternum, remainder pale. Forewings with oblique vittae or with oblique vittae usully forming continuous zigzag pattern, without crossbands. Clavus with continuous vitta parallel to suture or largely or entirely bright red or brown. Abdomen dark dorsally. rufostigmosa- Dorsum yellow or white. Color pattern red or orange or brown. Vertex with oblique lateral vittae or with large basal dark area often extended onto pronotum. Vertex midline pale or dark. Anteclypeus pale, concolorous with rest of face. 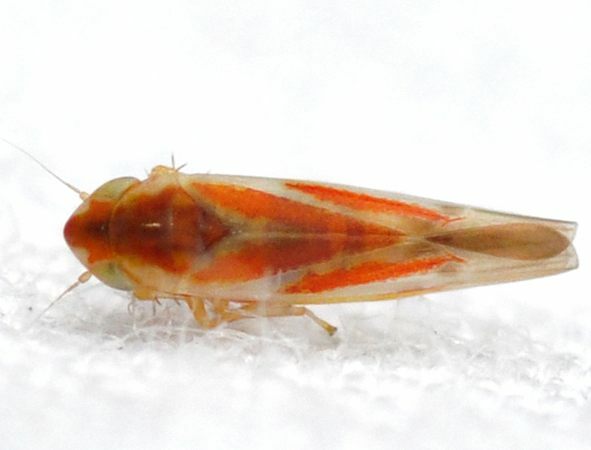 Pronotum dark with pale lateral margins or pale with two longitudinal stripes. Mesonotum entirely dark, apex concolorous with rest of mesonotum. Thoracic venter with dark mesosternum, remainder pale. Forewings without oblique vittae or with oblique vittae or with oblique vittae usully forming continuous zigzag pattern, without crossbands. Clavus with continuous vitta parallel to suture or largely or entirely bright red or brown. Abdomen dark dorsally. ohioensis- Dorsum yellow or white. Color pattern red or orange or brown. Vertex with large basal dark area often extended onto pronotum. Vertex midline dark. Anteclypeus pale, concolorous with rest of face. Pronotum dark with pale lateral margins or pale with two longitudinal stripes. Mesonotum entirely dark, apex concolorous with rest of mesonotum. Thoracic venter entirely pale. 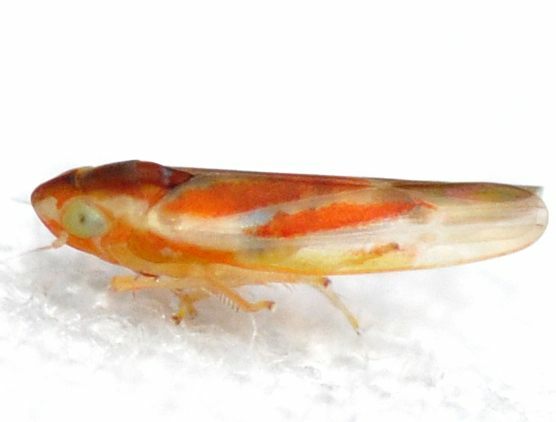 Forewings with oblique vittae, without crossbands. Clavus largely or entirely bright red or brown. Abdomen dark dorsally. wysongi- Dorsum yellow or white. Color pattern red or orange or brown. Vertex with oblique lateral vittae or with large basal dark area often extended onto pronotum. Vertex midline pale or dark. Anteclypeus brown or black. Pronotum dark with pale lateral margins or pale with two longitudinal stripes. Mesonotum entirely dark, apex concolorous with rest of mesonotum. Thoracic venter entirely dark. Forewings with oblique vittae or with oblique vittae usully forming continuous zigzag pattern, without crossbands. Clavus with continuous vitta parallel to suture. Abdomen dark dorsally. similalis- Dorsum yellow or white. Color pattern red or orange or brown. Vertex with large basal dark area often extended onto pronotum. Vertex midline dark. Anteclypeus pale, concolorous with rest of face. Pronotum dark with pale lateral margins or pale with two longitudinal stripes. Mesonotum entirely dark, apex concolorous with rest of mesonotum. Thoracic venter entirely pale. 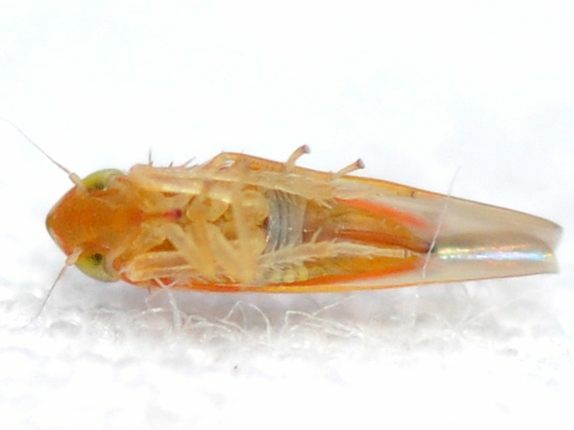 Forewings with oblique vittae, without crossbands. Clavus largely or entirely bright red or brown. Abdomen pale dorsally. Comment: Found on sheet in AM, attracted to Black Light. Most likely this species.